During his first three seasons as Baltimore’s closer, the lefty with the devastating sinker compiled a 1.38 ERA in 204 appearances, allowing just eight home runs. In 2016, he had a microscopic 0.54 ERA and went a perfect 47-for-47 in save opportunities. But in 2017 he ruptured his Achilles tendon, and the resulting surgery knocked him out for six months. Britton’s a free agent after the 2018 season, and the Orioles aren’t contending. To get even close to fair trade value for him, Baltimore needed the lefty to return, prove he was healthy and close to regaining the form that made him baseball’s best closer. The early returns were shaky. In his first eight appearances, he allowed eight hits, seven walks and six earned runs, and his fastball velocity was down. 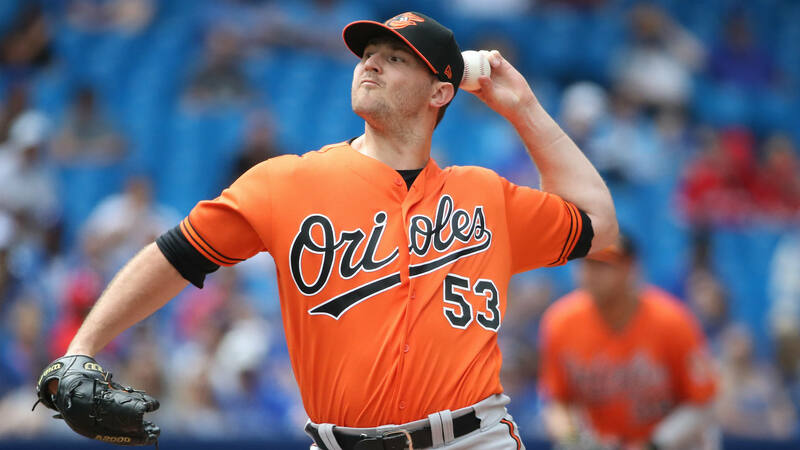 That’s not unusual for any pitcher returning from such a long layoff, but with the spotlight on Britton, many wondered whether his trade value had been torpedoed. Seems he just needed to shake off the rust. In his eight most recent appearances, he’s allowed only three hits and zero runs, and his velocity is climbing back up to presurgery levels. That was enough for contenders around the league to jump into the Britton sweepstakes. The truth is this: Every contender could use an established late-inning guy like Britton in its bullpen. So we’re going to rank just about every contender based on their need for Britton and their ability to work out a deal that would satisfy Baltimore’s ask for the lefty. It’s going to look a little different, probably, than which teams some tab as the favorites. The contender exceptions: Seattle (already traded for Alex Colome), Cleveland (already traded for Brad Hand and Adam Cimber) and Colorado (they’ve already poured a ton of money into their bullpen). Why they’re here: Even after Ken Giles’ disastrous performance in the 2018 postseason — he had an 11.74 ERA and allowed at least one run in six of his seven appearances — the Astros held on to him as their closer for 2018. His time in that role is done, the final nail in the coffin coming when he cursed at manager A.J. Hinch after a particularly disastrous outing on July 10. He was sent to the minors the next day. So the Astros, a team that’s otherwise well-positioned to win a second consecutive World Series title, need late-inning bullpen reinforcements. Not only does Britton have an established track record as a closer, but he’s left-handed, too. Tony Sipp has done a good job (1.85 ERA in 28 appearances), but he’s the only lefty who has thrown more than four innings of relief for the Astros this year, and he’s not in the closer mix. The Astros have the quality and quantity of prospects to get this deal done, if they want to make it happen. They were the easy choice for the top spot on this list. Why they’re here: Pretty much every trade rumor connected to the Braves includes the caveat that Atlanta is hesitant to exchange prospects for a 2018 rental. Britton, of course, is a 2018 rental only. But here are two realities: 1. The Braves are legit contenders for the NL crown. 2. The Braves need bullpen help. Closer Arodys Vizcaino is on the DL with shoulder inflammation, and the best way to describe the rest of the relief crew is “mediocre, at best.” The bullpen’s 4.24 ERA is the worst of any team currently in a playoff spot. Britton would be a big, big upgrade if the front office decides it’s worth making a push toward a World Series berth. Why they’re here: Closer Brandon Morrow is on the DL for the second time this year, and though his issue (biceps inflammation) isn’t long-term, the Cubs could use another established arm in the back of the bullpen if they want to make a deep run through the postseason. They’ve already traded for reliever Jesse Chavez, but he is more of a bridge to the late innings than an eighth/ninth-inning guy. Why they’re here: The Dodgers are set at closer, of course, but the rest of the bullpen has been a mix of inconsistency and injuries. At the moment, Josh Fields, Yimi Garcia, Tony Cingrani and Pedro Baez are all on the DL, and Jansen is the only healthy reliever with an ERA under 3.15. Even though the clubs didn’t expand the Manny Machado deal to include Britton, don’t assume this couldn’t happen. If anything, the Orioles have a better idea of what the Dodgers have and what they could ask for than they might with other teams. Why they’re here: Hector Neris started the season as the closer, but struggled (6.90 ERA) to the point where he was sent down at the end of June. Seranthony Dominguez has done a great job in that role (2.10 ERA, 9-for-10 in save opportunities), but most everyone else has dealt with inconsistencies in their performances. Edubray Ramos had been very good (1.91 ERA), but he just landed on the DL with a patella tendon strain. Adding an established late-inning guy to that group would bring much-needed consistency. Why they’re here: They’ve been heavily connected to relief help on the rumor mill, and Britton makes sense, if they’re willing to pay the prospect price. Craig Kimbrel is locked in as a lock-down closer, and Matt Barnes, Hector Velasquez and Heath Hembree have been solid. But Brian Johnson (3.81 ERA) is the only left-hander in the bullpen. Remember, at this point, the Red Sox have only two main goals: Win the AL East (avoiding the wild-card) and winning the World Series. Britton would help Boston achieve both. Why they’re here: The rumors flying around this week all point to the Yankees’ “serious” interest in trading for Britton. And this franchise certainly has the prospect pieces needed to make a deal happen. But the Yankees’ bullpen is already pretty damn good, so you have to wonder if the motivation is there to out-bid other teams trying to land Britton. Yes, Aroldis Chapman struggled to find the strike zone in his most recent outing, but in his 18 previous appearances, he had a 1.08 ERA and struck out 27 — with only five walks — in 16 2/3 innings. If the Yankees are going to spend the prospect capital necessary to land Britton, it makes sense they might focus on a starting pitcher. Why they’re here: They’ve been connected to Britton. And as we mentioned with their possible interest in Jacob deGrom, the Diamondbacks know they have a team capable of winning a playoff series or two, but they also know that Patrick Corbin and A.J. Pollock are free agents after this season and that Paul Goldschmidt is eligible after 2019. That’s motivation to win now. Their bullpen is solid, with Brad Boxburger as the closer, supported by Archie Bradley, Yoshihisa Hirano, T.J. McFarland and Andrew Chafin, but a healthy Britton makes any bullpen better. Why they’re here: They’ve been connected to Britton, and he would be a welcome addition to an already solid bullpen. But with the news on Monday that Brent Suter is heading for Tommy John surgery and the club’s needs in the middle infield, it’s hard to imagine the Brewers would pay the prospect price it would take to land Britton. Why they’re here: Yep, they’ve been connected in the rumor mill. And, yep, they could use Britton in the bullpen. But are they willing to outbid other teams for Britton — heck, could they? — in a season that’s hovered right around the .500 mark for a long time now? That doesn’t seem very likely.